Mr. Burciaga is a founding member of ARM Energy. Prior to forming ARM Energy, Mr. Burciaga was a founding member of Dynegy, Inc. (formerly Natural Gas Clearinghouse). He served as one of six senior vice presidents involved in the startup and growth of this Fortune 500 trading company and market maker, and he was a member of the four-person team responsible for taking the company public. 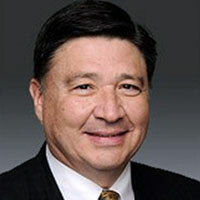 Mr. Burciaga served as Senior Vice President of Natural Gas Supply & Trading. Because of deregulation to the merchant role and price controls during this period, Dynegy faced a very volatile natural gas market. Dynegy emerged as a dominant player and became the largest independent and the second largest natural gas marketer in the United States. During his tenure (1986-1991), Dynegy was one of the fastest growing companies in the United States. From 1992-1997, Mr. Burciaga was President of NGC Energy Resources, a division focused on the acquisition and operation of downstream natural gas assets including gathering systems, processing plants, and natural gas liquids fractionation plants. Acquisitions made in the U.S. and Canada under his direction exceeded $900 million. Mr. Burciaga is a graduate of Texas A&M University.